What is the Circular Economy? | Rethink Global What is the circular economy? In a nutshell, it’s a newish term for a better way of doing things. It combines eco-design, biomimicry and resource efficiency with systems thinking, to provide more effective, sustainable ways to make and use everything: so we can have enough, for all of us, forever. It aims to keep products, components and materials in use for longer, and reuse them, so we get more value out of them. In a circular economy, all ‘waste’ becomes ‘food’: either for another industrial process; or for nature. 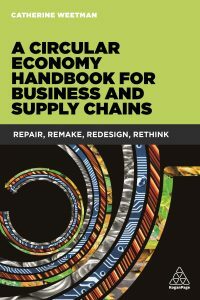 New materials, scientific advances and recent technology developments mean circular business can be more resilient, competitive and prosperous. Why is the circular economy important? Circular economy business benefits – how does it help you succeed and prosper? What do we mean by the ‘linear economy’? Do you want to learn more about the circular economy, and how it can strengthen your business? Governments, businesses large and small, NGOs and consultancies are investing in circular economy approaches. The World Economic Forum, McKinsey, the Ellen MacArthur Foundation, the European Union and many other organisations are helping to accelerate the transition from linear to circular, sustainable and prosperous models. There are widespread savings from reduced material use, efficiencies in production and the supply chain. These lead to lower levels of waste, pollution and GHG emissions. For the European Union, McKinsey and the Ellen MacArthur Foundation estimate 7 per cent growth in GDP (Gross Domestic Product), with potential for up to half a million new jobs. According to Accenture, “shifting to the circular economy could release $4.5 trillion in new economic potential by 2030“. There isn’t a universal definition of a circular economy – a recent study by Kircherr, Reike and Hekkert found 114 different definitions! We design products and equipment to be durable and robust, so they stay in use for longer. For the user, this means a better lifetime cost, as robust, repairable products can be rented, or shared, meaning that more people can use fewer products. An example is city bike rental, which might be in use for say 12 hours a day; compared to your personal bike that you use perhaps once a week. Business models encourage the use of products and equipment, instead of ownership. Circular approaches also create markets for new services: for reuse, repair, remanufacturing and recovery of resources. After we’ve used them, we recover the products, components and materials. This means they have value as a resource for another industrial process, or can be food for nature – compost! Different perspectives, including systems thinking, biomimicry and planetary boundaries, can help us create new solutions and disrupt existing alternatives. using and regenerating safe, sustainable resources – so we have abundant supplies instead of scarcity. In the linear system, companies want to sell more. They try to persuade us to buy the latest kit to replace the one that’s broken or no longer supported. This wastes precious resources – and wastes our money! We should question why we want to own stuff that we only use for a few hours each year. Owning it while it depreciates, the performance drops away, or the technology becomes out-of-date: all of which leave us worse off. Examples include a power drill and even a car. Did you know that on average, cars in Europe are idle (ie parked) for 23 hours each day? The circular economy uses different business models, aiming to encourage use instead of ownership. It’s about helping people to use products for longer, or use them more ‘intensively’. What do we mean by ‘intensively’? Let’s return to our car example (typically used for just one hour each day): an hourly rental system would enable the people to use the car for significantly more hours in a day. We improve the ‘intensity’ of use – in other words, we get more from less. 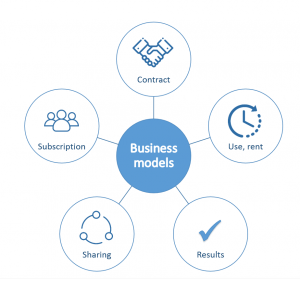 These business models encourage users to rent; pay for access; buy ‘performance’ of products and equipment, or subscribe to an easily accessible shared service. This creates new revenue streams and market opportunities for your business. Designing circular systems can build a better business (and a better world). We’ve looked at circular business models, but what else should we do differently? 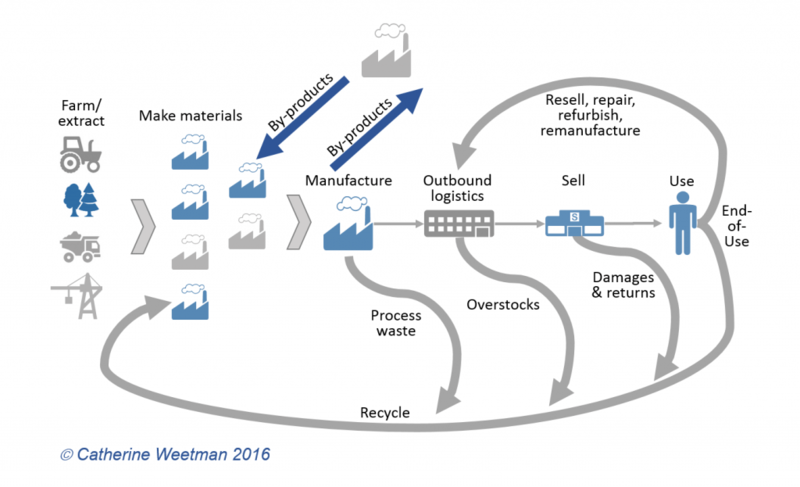 Rethinking your business to ‘close the loop’ completely, creating ‘cradle to cradle’ products, may seem overwhelming, or too disruptive. 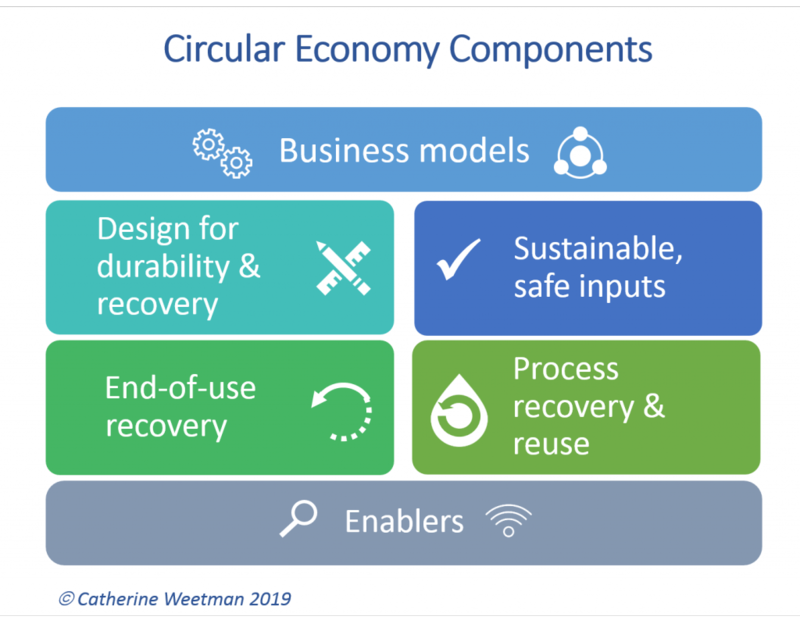 To reduce the risks you can use an incremental approach, starting with any of these other circular economy components. You might decide to replace a material that’s expensive, or difficult to source. Alternatively, you could offer upgrade or repair services for one of your products. 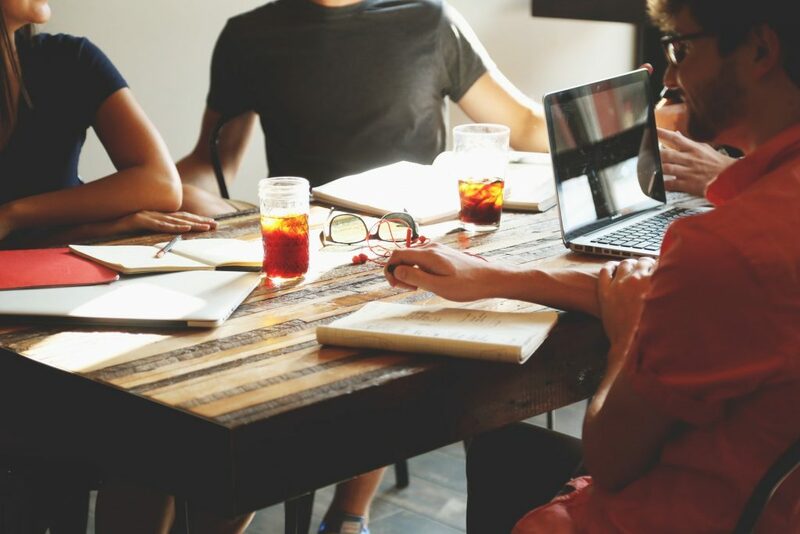 You can feel more confident by building a solid business case and engaging employees, suppliers, customers and other stakeholders. Thinking about the bigger system and creating a sensible project plan can avoid ‘unintended consequences’. Learning from your first circular success improves your next project, building confidence across your business as you close the loops. High quality, durable and repairable products improve your customer’s experience, thus building trust in your brand, leading to loyal customers. You’ll benefit from spending less on marketing to find new customers. Selling spare parts and offering repair and refurbishment services means you can create new revenue streams. Designing products to be modular means repairs are simpler and cheaper. Modular products make it easy for you to develop and offer upgrades, such as new technology, better functionality, etc. The modular design of the Fairphone 2 mobile phone means the user can swap out any part in a few minutes, needing only a screwdriver. Upgradable products are a win-win because the customer gets a better product, and you keep the customer’s business. The Fairphone 2 is upgradable, too. Designing products for repair, remaking and recycling creates new, profitable activities and reduces the cost of repair, remaking and recovery. That could mean new service opportunities for you – or your partners. Longer-lasting products have a higher resale value; they build trust in your brand and mean you can sell in markets where people can’t afford the new product. Specifying fewer, simpler materials, helps create circular systems too. Avoiding adhesives, bonding, coating and other compounds makes it easier and cheaper to reuse the materials, repeatedly. Ensuring all materials are easy to identify, with standard markings where possible, helps encourage recycling and reuse. Metals, minerals and fossil fuels are finite resources (‘technical resources’ in circular economy terms). Even if the sources seem to be plentiful, issues including trade restrictions and tariffs, by geopolitics, conflict and natural disasters can all affect supplies. Food, fibres, timber and other ‘renewable’ materials (‘biological resources’) are also constrained: by water, suitable land, as well as the risks above. If we choose a renewable material, we must ensure it’s produced sustainably and can renew within the intended lifecycle of the product. For example, if we harvest a tree to make five chairs, those chairs should last for as long as it takes a new tree to grow to a harvestable size. There are increasing concerns about the social and environmental impact of farming, fishing, forestry, mining and material extraction. Over-fishing, deforestation, the use of synthetic pesticides, fertilizers from fossil fuels, intensive irrigation in areas or water scarcity and many other issues are highlighting our dependence on unsustainable material sources. The resources you choose, for both the product and the process, should be renewable or recycled, so you can be confident of the reliability (‘security’) of supply. Critically, all inputs should be safe for humans and living systems, at every stage of the process. New materials are appearing, including plastics from abundant materials like algae, ‘leather’ from mushrooms, ‘silk’ from waste citrus peel, and many more. Designing more circular production processes provides benefits. Maybe you can recover your own end-of-life products, components and materials. Recoverable resources include energy, chemicals and water, as well as the materials you use to make the product. In addition to reducing costs by recovering your own inputs, you could develop new by-products and thus increase your revenue by selling into new markets. British Sugar creates a wide range of by-products from its production process, ranging from topsoil and aggregates to bio-energy and animal feed. It recycles waste heat and CO2 from manufacture to grow crops in nearby hothouses too. Resource efficiency approaches are useful too, helping us focus on using less of everything and thus saving money too. We want to keep products and materials flowing around the system, ideally without losing ‘value’ for the next cycle. High quality, durable products will have resale value for another ‘use cycle’: perhaps by the user (eg on eBay), by a specialist reseller, or by the manufacturer. In Japan, Patagonia’s clothing may resell at a much higher price than the ‘new’ version! IKEA, noticing that many of its products were for sale on eBay, realised it didn’t undermine this business. Instead, it helped the original consumer feel confident they could resell the product in the future, and thus reinforced the brand value. IKEA decided to support this by providing easy access to commonly used fixings and fasteners, making replacement easy if those small parts are lost during disassembly. Recovering your products gives you easy access to your own components and materials – and designing for easy disassembly makes it efficient for you to reuse, refurbish or replace them to give another life to the product or the material. We’ve looked at the benefits for the economy, but how do you work out the advantages for your business? There are many different benefits of ‘closing the loop’, for business customers and consumers. One advantage of using instead of owning is that it smooths cashflow: that can be a big plus for business buyers. Renting, leasing, sharing and subscription services are attractive for consumers too: it’s already common for cars and phones in some countries, and of course for housing. Those durable, robust product designs are more suitable for renting and sharing. This opens up new opportunities, especially for products that people use infrequently (eg power tools), or in a range of different places (eg city bike and car hire). Those services could help you could grow your business, perhaps by renting a higher quality product at a more affordable price. BMW developed its DriveNow rental service, finding it helped to grow a much bigger customer base. In a circular system, upgrade options and repair services can keep the product up to date and fully functional for longer. It may even be attractive for the end users to repair and upgrade it themselves. This means you can sell spare parts, offer repairs and servicing, and even set up specialist remanufacturing and recycling services – maybe with a partner. The upside is new revenue streams and market opportunities for your business. Services mean ownership of the product stays with the brand and enables the product to return to the producer after we’ve used it. Having recovered the product, component and materials, the producer can choose to resell, repair, remake or recycle them. You can save money on materials, energy and process inputs, and reduce waste and harmful emissions. You may be able to convert disposal and waste costs into savings, and new profit streams. Business models providing access to products, instead of ownership, can build closer customer relationships. 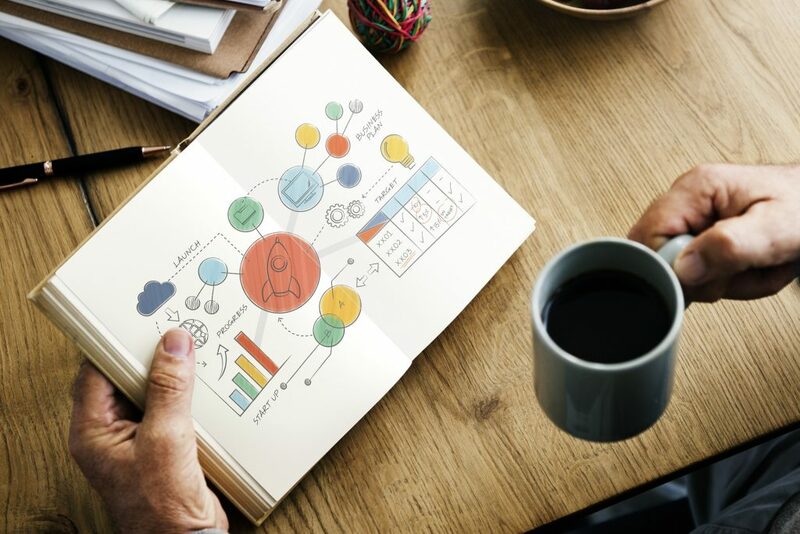 Regular communication flows help you better understand what they need and how they use your product. You’ll know which parts are likely to degrade or fail first, and how you can improve it. Your customers enjoy great quality, reliable products, that are easy to repair and upgrade, thus saving money and the hassle of buying (and getting used to) a new one. Knowing something is repairable (ideally with a strong warranty) means they feel confident about buying your products – and repairing, improving or customising it makes them feel more engaged with it. It means they are more likely to recommend you and stay loyal to your brand. Most modern systems, for products, equipment and infrastructure, follow a similar process. We take some materials, make a product, use it and then discard it. We extract around 90 billion tons of natural resources, every year, to make what we consume. That’s more than 12 tons for every person on the planet. Based on current trends, that number is likely to double by 2050. The systems we’ve created are shockingly wasteful. The Circularity Gap report says we recover less than 10 per cent of our resources to make them into new products. we are overloading and depleting nature. It’s easy to forget that we depend on living systems that provide critical services for us, including pure air, clean water and healthy soils. 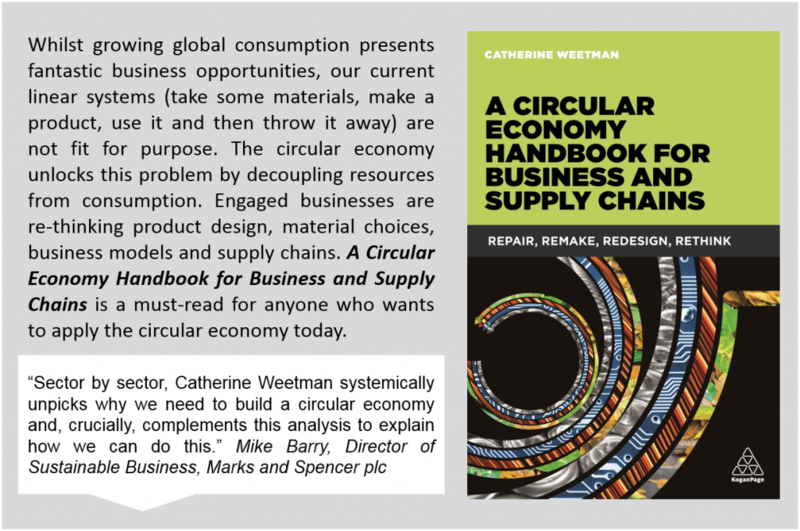 To learn more about the circular economy, and how it can strengthen your business, please get in touch to discuss a private workshop or talk, or arrange a 1-to-1 coaching session – or buy the book!